Thanks to everyone who linked up for last week's Frugal Friday! First up, I adore this big girl's room from Jennifer at Dear Lillie. This woman is SOOOOO talented! If you haven't visited her blog before, you're in for a treat! Next Lindsey at Lee La La shared a DIY for these darling photo tile coasters. Love this idea! The Sweet Survival shared another great DIY for a felt monogram pillow. 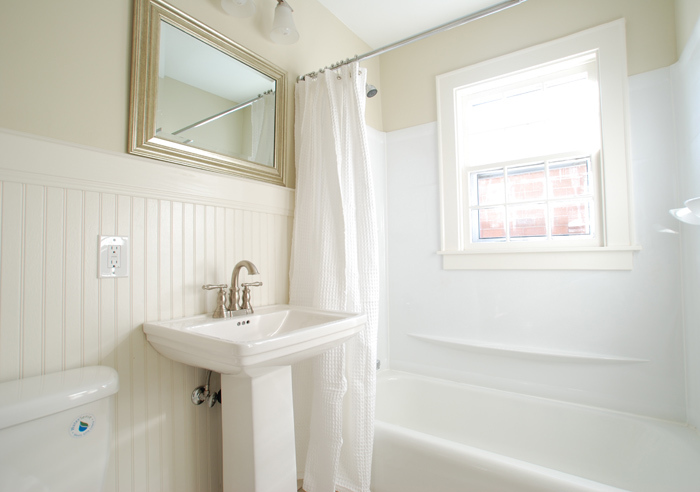 And finally, Remodeling Twin Cities shared a great bathroom makeover. You know I'm a sucker for beadboard wainscotting. This before and after is FAB! 1. Please link directly to your post, not just to your blog. 3. Please visit links and leave comments for our participants. Help them feel "the love"! I reserve the right to remove posts that are not in keeping with the spirit of Frugal Friday including (but not limited to) those that link to your shop, those that link to your giveaway, or those that do not link back to the Shabby Nest. This is a great way to drive traffic to your blog, but let's all play fair 'mkay? Thanks so much for hosting today!Hope you have a great weekend. Oh my gosh Wendy you just made my week! A feature from YOU! AHHHH! Thank you Thank you! I am honored :) Hope the family is well my friend! HUGS! Have a great weekend! Thanks for hosting again this week. I am so delighted to join in on your party this week! Thank you so very much for hosting! Thanks for featuring my pillow! That bathroom makeover is fabulous! Thanks for hosting - I really appreciate it! I'm in LOVE with that pillow...thanks so much for hosting! Can't wait to check these out. I am new to your lovely blog. Thanks for hosting....I linked up. Thanks for hosting! I look forward to the link party every week! Hi, thanks for hosting. Just linked up my magnet strips from scraps!! Thanks so much, Wendy!!!! I have been completely MIA from my computer this week but was so excited to get on and see this! LOVE those coasters! I hope you are having a wonderful weekend!